Haulin-N-Such provides construction and demolition material removal for Akron & Medina, OH. Our demolition contractors can accept any Construction & Demolition Material. This consists of the materials used to construct a building, ranging from roofing shingles, vinyl windows, doors, drywall, electrical fixtures, furnaces, kitchen cabinets, fixtures, and more. To make demolition a smoother process, we provide dumpster rentals to contractors or homeowners for construction and demolition debris. Rent one of our dumpsters for your next demolition project, work at your own pace, and keep a clean work area! Providing junk removal for demolition projects in Medina and Akron, OH. Environmentally responsible. Instead of throwing out all remnants from a demolition project, we keep many materials and reuse them. We are dedicated to environmental responsibility, and are happy to offer waste removal advice. Less work for you. Instead of taking on a demolition project, hiring a demolition contractor from Haulin-N-Such will reduce your workload 100%. We are efficient and affordable, making the least possible mess to your property. Safety. Trying to demolish a building on your own might not be the safest venture. Our professional demolition contractors understand how to execute the project from start to finish! Ask us about dumpster rentals in Akron, OH. After your demolition project is complete, you’ll need to remove the construction materials from the scene. Often, a dumpster rental is one of the best options. 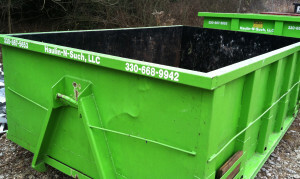 You can fill your dumpster rental up as much as you please, and then contact us to remove it from your property. This makes your life easier, instead of having to rely on filling up multiple garbage cans or waiting for a demolition truck to come by. If you live in the Akron, OH area, please contact us to rent a dumpster today.